As a family, travelling is something that all of us enjoy. For this 10 post series I am writing about a few offbeat places that we went. We spent a few years in Bangalore and now in Pune, so most of these places are around Bangalore or Pune. While there are many other locations that I could write about, I chose these off beat places as they are less traveled, hence not many know about them. 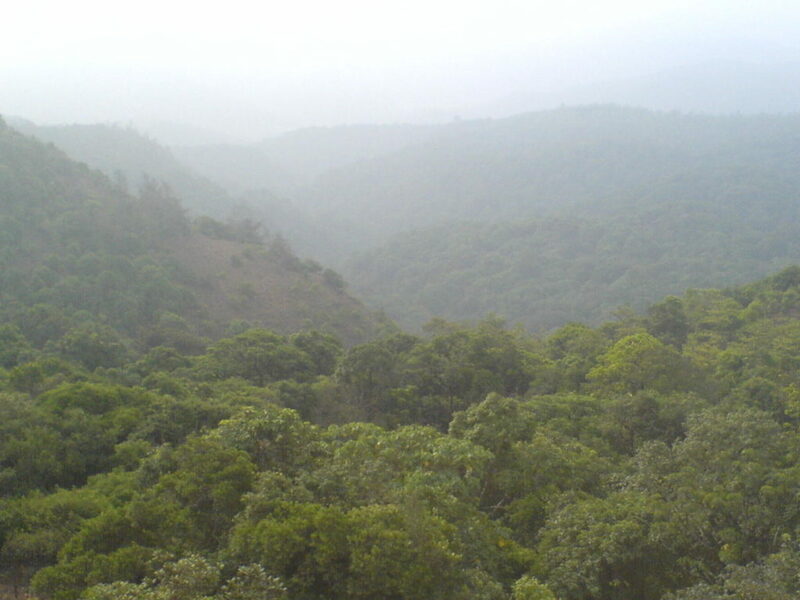 Madikeri is a hill station town in the Kodagu or Coorg region. Coorg is also known as the Scotland of India for its similarities in terms of plains, plantations and weather. Coorg on the whole is a beautiful place, but the few popular destinations here are Madikeri, Talcauvery and Bhagmandala. We had been recently married and didn’t have a car to drive around and my husband was skeptical about the state transport to take us to our destination. So we decided to take the KSTDC tour package that offered Madikeri, Talcauvery and Bhagamandala. Recently checked, the package is still available with KSTDC and if you are okay with trying local food and being in decent but not very fancy hotels then you can certainly check them out. They offer value for money and decent accommodation and food. Apart from this you can drive down to Madikeri from Bangalore. During our trip, we also saw The Golden Temple, a Tibetan Monastery at Bylakuppe. That one was a surprise for us as we didn’t know anything about it. It is a wonderful temple with amazing Tibetan art. If you are travelling from Bangalore, this is something that I would highly recommend. As you near Madikeri, there is a certain dip in temperatures and air is crisp. It is a great place to visit all year round but the best would be from October to March or April. Avoid going there in the monsoons as the rains are heavy and most of the places that need a bit of trekking are out due to the leech menace. In Madikeri, you must visit Abbey falls and Raja’s Seat. Abbey Falls is a beautiful white cascading waterfall that is easily accessible if you wish to swim. It is located in the private coffee and spice plantations. The best time to see the falls is just after monsoons have receeded. Raja’s Seat is a viewing point that offers panoramic views of the valley. There is a small garden at the top. The most popular time when tourists flock to the place is during sunset. Talcauvery is considered the birthplace of the river Cauvery. There is a small temple near the source. There is a tank built at the source of the river and from there the water flows downhill. It is considered holy to take a dip in the water on certain days. While we didn’t take a dip at the river, the views from around the tank and the temple are breathtaking! The vehicles reach almost till the top. You just have to walk/trek a small distance but it is not much. I wish to go back with some treks and biking added to the itinerary and hope that this happens soon! Have you been to Madikeri and did you do any of the road trips or treks there? Would love to hear about it. This article is written as part of #SuperBloggerChallenge2018, conducted by Healthwealthbridge, FashionableFoodz and Allaboutthewoman. It should not be repurposed, republished or used otherwise. The content herein is owned by the blogger. SuperBloggerChallenge2018is not responsible for any kind of infringement caused. Seem to be wonderful spots to visit. Informative. I really would like to visit Madekeri this October. We have not gone to the hills in awhile and this place just seems to be calling me. Beautiful pictures, Neha. You made it sound so exotic, I want to go there and experience it myself soon. Madikkeri is beautiful. We pass via this place while we go home and spend some time there. Beautiful pics . the Bylekuppe temple has been on our list since long. Thanks Preethi! I was mesmerized looking at all the art there. I have heard about coorg district a lot from those who live in Bangalore and this post makes it must visit place. Coorg is surely the next heaven on Earth. I didn’t know there is another Golden Temple in India. Your details are really helpful to plan a trip here. I like such close to nature places. This one looks like my type. Looks like a beautiful place ewith serenity and calm. Hope you had loads of fun on your trip. I liked you way of exploring a new place. There is so much to explore in or country. So true Manisha!! We have immense beauty in our backyard, all we need to do is maintain it! A friend of mine visited this place and has been gaga about it and now after reading your post I am sure we have to visit it once #Superbloggerchallenge2018. Seem to be an amazing place to visit. Informative! I’ve visited all these mentioned places and Madikeri is my favourite place. Hoping to visit it soon. The places that you described in this post are looking so awesome . Coorg is the beautiful place wish to go here soon with my family and friends. Now this place is on my bucket list. Thanks for sharing this information great work.